Playing and singing country blues guitar is no easy task. It's just you and the box summoning up the requisite guitar parts, singing the melody and maintaining a solid groove. No drummer. No bass player - just you and your guitar. Independence, repertoire, technique, timing and endurance comprise the essential skill set for authentic fingerstyle country blues guitar. Playing and singing the material in this 2-DVD set hones these skills like nobody's business. 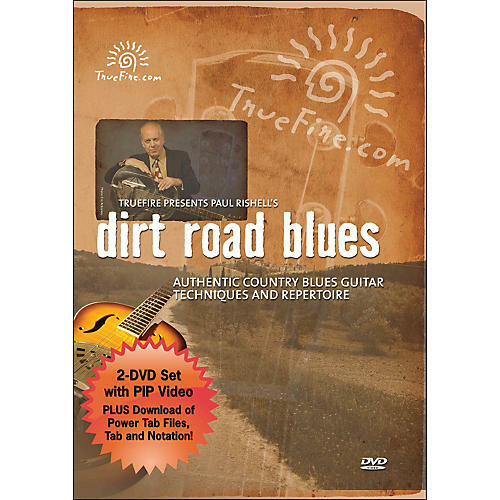 Paul Rishell diligently guides you through 16 handpicked tunes to cover a wide variety of the feels, rhythms and techniques that are characteristic to country blues guitar. You'll learn all of the parts, rhythms and requisite techniques for Down the Dirt Road Blues by Charley Patton, Shake 'Em on Down by Tommy McClennan, Low Down Rounder by Peg Leg Howell, Sweet Jivin' Mama by Blind Blake, One Dime Blues by Blind Lemon Jefferson, Rag Mama Rag by Blind Boy Fuller, Trouble Blues by Scrapper Blackwell, Black Horse Blues by Blind Lemon Jefferson, Custard Pie by Blind Boy Fuller, Hunkie Tunkie and Keep it Clean by Charley Jordan, Step It up & Go by Blind Boy Fuller and four Rishell originals; Vanessa, Louise, I'm Gonna Jump & Shout and Blues on a Holiday. Get a solid grip on this Delta, Piedmont and Texas blues guitar repertoire and you'll be able to handle anything (including your own compositions) with authenticity, stellar technique and maximum groove. Head out to the porch now with Dirt Road Blues. 146 minutes.